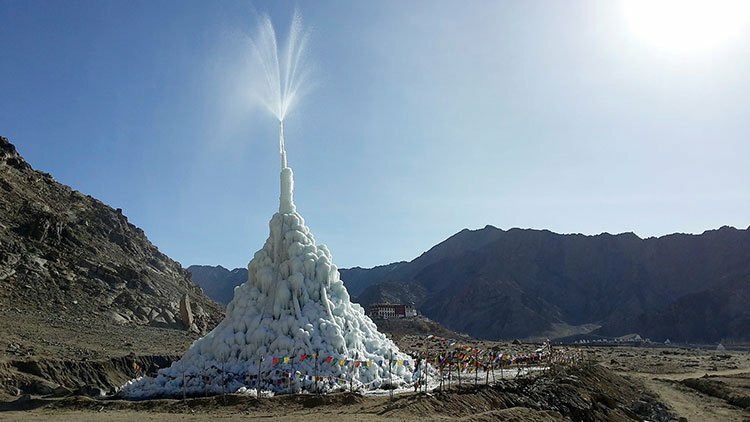 An ice stupa created by the innovative engineer Sonam Wangchuk in Ladakh, India. Ice Stupa is a form of glacier grafting technique that creates artificial glaciers, used for storing winter water (which otherwise goes waste) in form of conical shaped ice heap. During summer, when water is scarce, the Ice Stupa melts to increase water supply for crops. Ice Stupa was innovated by Sonam Wangchuk in Ladakh, India and the project is undertaken by the NGO Students’ Educational and Cultural Movement of Ladakh. Launched in October 2013, the test project started in January 2014 under the project name The Ice Stupa project. On 15 November 2016, Sonam Wangchuk was awarded Rolex Awards for Enterprise for his work on Ice Stupa. Ladakh is a trans-Himalayan mountain desert in the extreme north of India with villages located at 2,700m to 4,000m altitudes. It is a cold desert with winter temperatures touching -30° C, and an average annual rain/snow fall of only 100 mm. Human settlements are almost always located around glacial streams which feed into the Indus and other rivers as tributaries. The key to human settlement in this cold desert is the art of diverting water from the streams through meticulously built canals toward deserts to grow crops like barley, wheat, vegetables and trees like apricots, apples, willow and poplar. Most villages face acute water shortage, particularly during the two crucial months of April and May when there is little water in the streams and all the villagers compete to water their newly planted crops. By mid-June there is an excess of water and even flash flooding due to the fast melting of the snow and glaciers in the mountains. By mid-September all farming activities end, and yet a smaller stream flows throughout the winter steadily but wastefully going into the Indus river without being of use to anybody. The problem is getting worse with time as Himalayan glaciers are disappearing due to global warming and local pollution. The idea behind artificial glaciers is to freeze and hold the water that keeps flowing and wasting away down the streams and into the rivers throughout the winter. Instead, this ice will melt in the springtime, just when the fields need watering. This is achieved by freezing the stream water vertically in the form of huge ice towers or cones of 30 to 50m height that look very similar to the local sacred mud structures called Stupa or Chorten. These ice mountains can be built right next to the village itself where the water is needed. Very little effort or investment would be needed except for laying one underground pipeline from a higher point on the stream to the outskirts of the village. Gravity pressure forces water up through a pipe to form ice stupas that store water for the crop growing season. The idea is very simple and needs no pumps or power. We all know that water maintains its level. Therefore, water piped from 60m upstream would easily rise close to 60m up from ground when it reaches the village. For simplicity we can imagine that the pipe is mounted on a mobile-phone tower of that height, and then it is made to fall from that height in cold Ladakhi winter nights when it is -30 to -50°C outside (with wind chill factor). The water would freeze by the time it reaches the ground and slowly form a huge cone or Ice Stupa roughly 30 to 50m high. The idea is also to conserve this tower of ice as long into the summer as possible so that as it melts, it feeds the fields until the real glacial melt waters start flowing in June. Since these ice cones extend vertically upwards towards the sun, they receive fewer of the sun’s rays per the volume of water stored; hence, they will take much longer to melt compared to an artificial glacier of the same volume formed horizontally on a flat surface. 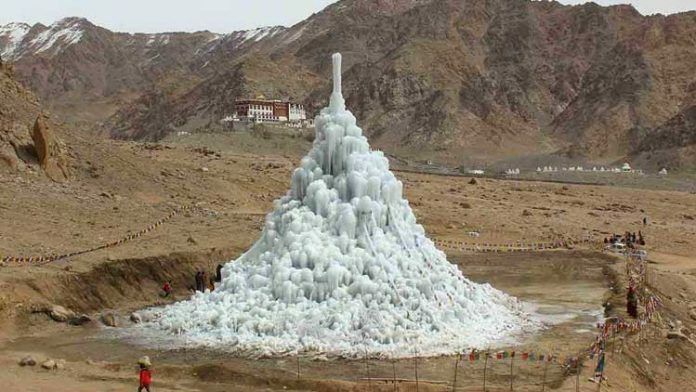 In October 2013, Sonam Wangchuk created the first prototype of 6 metres (20 ft) Ice Stupa by freezing 150,000 liters (40,000 US gallons) in Leh without any shade from the sun. Water was piped from upstream using gravity. Electricity or machinery was not used for pumping water. The Ice Stupa did not melt fully until 18 May 2014, even when the temperature was above 20 °C (68 °F). With the grant from Rolex, Wangchuk is now working on creating the next generation of ice towers – 20 more, each 100 feet high.